Show your visitors the cost benefit of purchasing multi-product sets compared to just a single product with the Best Value Offer block. The main purpose of this block is to show your visitors the cost benefit of purchasing multi-product sets compared to just a single product. Use this block to compare prices for 1 product, a set of 2 products set and a set of 3 products for example. Just follow the steps below. Set the Title for each of the 3 product elements within the block. Try to keep it short and make sure that it it grabs your visitor's attention! Select the products for each section by clicking on "Buy Now" button or the green pencil icon of each section. If you select a product with variants, it will display the list of product variants. 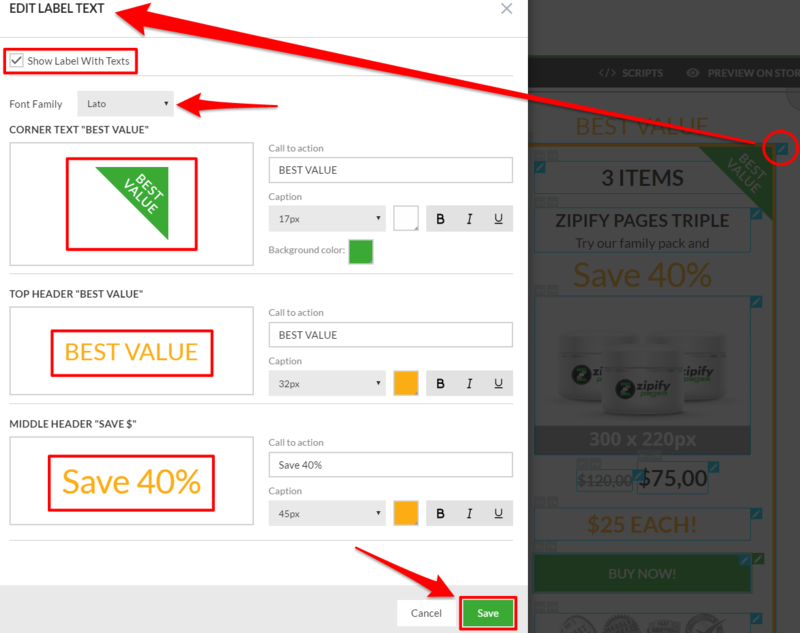 By default, Zipify Pages uses all of the available variants. But, you can select specific variants which you'd like to have displayed for this product if desired. To select several variants you need to push and hold the CTRL button on your keyboard while selecting the variants with the left-click button of your mouse. NOTE! If you add a new variant for the selected product through your Shopify admin panel, it automatically becomes available and selected in the product element. So, keep that in mind so that you can edit this block and exclude the additional variant(s) if you don't want it shown. Don't forget to click the Publish/Update button to apply this change to the actual page. 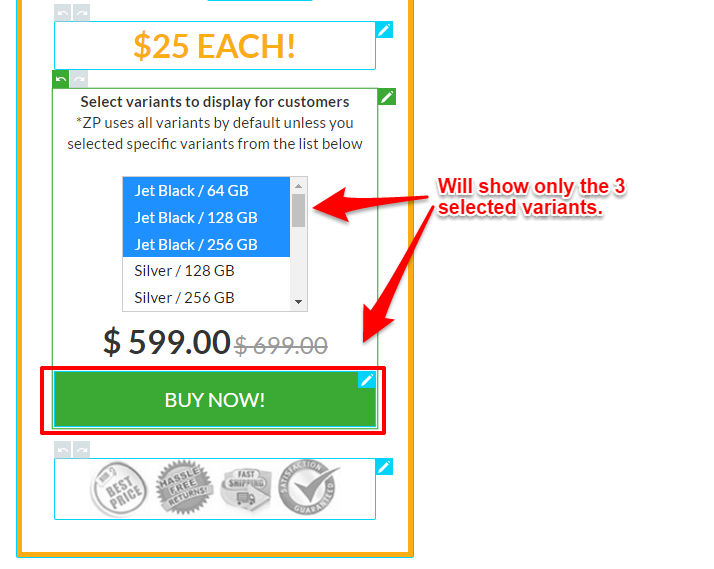 For Best Value Offer 1 and 2, when you select a product with variants for these blocks, there isn't a way to remove the "dynamic price" above the CTA (Best Value Offer 1) or in the bottom center (Best Value Offer 2) if the Cart or Checkout destination is chosen. That price is dynamic and will update based on the variant selected by the customer. If that product doesn't have variants, that price will not be shown on the published page, even if it shows in the page editor. If you don't want that price shown, you'll have to use a product that doesn't have variants or choose a different destination than the Cart or Checkout. The next step is to edit the Button element. This button element contains the same controls as the common button plus an additional feature - an ability to select where this button will direct the visitor to once clicked (Button Destination). Product Page - opens the product's detail page on your Shopify store. Add to Cart and load the Cart page: Opens the Shopify Cart page with the specified product added to the Cart. Add to Cart and stay on the same page: Adds the item to the cart and stays on the same page. An "add to cart" pop-up notification will appear when clicked. Add to Cart and direct customer to a specific URL: Adds the item to the cart and then directs the customer to your specified URL. Note: The text for this popup notification can be edited here as well. This field accepts both regular text and HTML tags which allows you to add links, styles etc. Checkout - opens the Shopify Checkout with the specified product added to the Checkout. URL - directs the visitor to any specified URL. Note: In case you're changing some product information through the Shopify admin panel, these changes will not be automatically be applied to the ZP page which contains this product. If you want the changed description or image to be reflected on the ZP page, then this should be done manually through the page constructor or just re-select the product for the block once again. 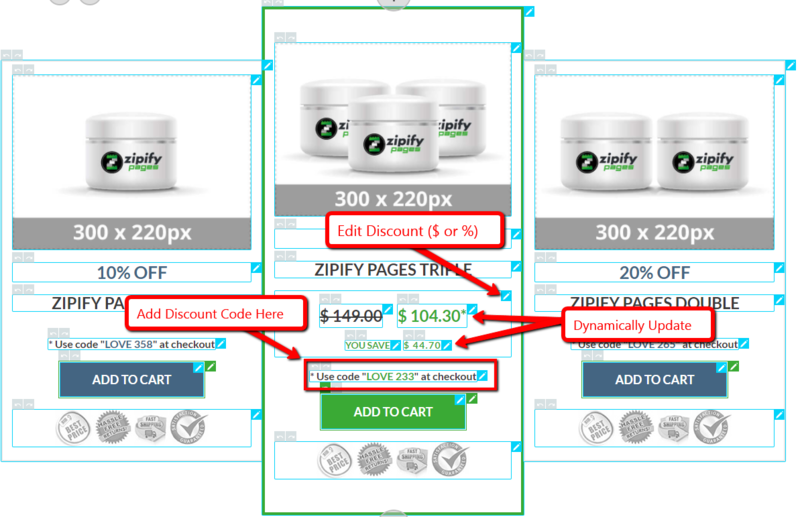 This rule doesn't affect the product price - Zipify Pages always uses the most recent product price set by you, the store owner. Upload images for each section (1 Item, 2 Items, 3 Items) by clicking on the image element itself or the blue pencil icon and set the regular and special price for each section's product. Click the blue pencil icon at the very top-right corner of each section to open the "Edit Label Text" popup to edit each sections label text if desired. Note: It's recommended to only have the "3 Items" section contain the label info, but you can add labels to the other sections if desired, just make sure the "Show Label With Texts" option is checked. Set custom trust seal, value proposition or payment option images at the bottom of each section or leave it as is if it works for you. This block is specifically designed to offer a discount code. With Best Value Offer 3, there is an element to enter a % or $ discount for the product. When entered, the "Exclusive Sale Price" and "You Save" prices will dynamically update based on the discount set by you. Note: The price that is pulled in and crossed out is the actual price of the product, not the "compare at" price. Make sure to include the Shopify Discount code you've created in the "*Use code" field so that your customer's can use it to obtain the advertised price at checkout.